Select the “Site Admin -> Module Manager” menu item. Click the “Available Modules” tab to see all available modules, or the “Search” tab to search for a specific module. 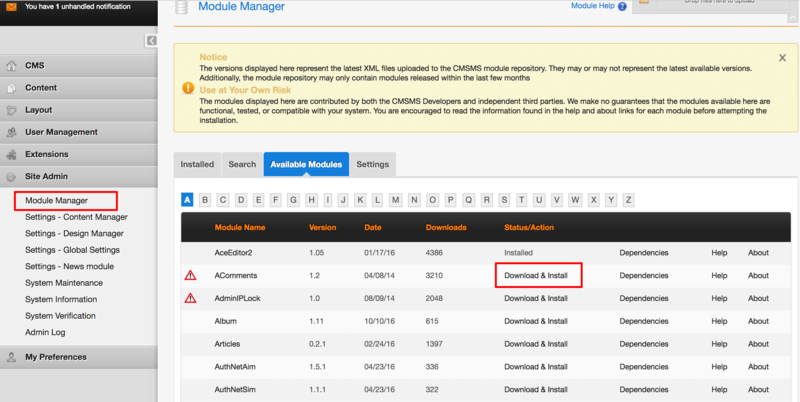 Click the “Download & Install” link next to the module you wish to install. The module will now be downloaded, installed and activated. Once done, the new module will appear in the module list on the “Site Admin -> Module Manager” page and under the “Installed” tab.